Welcome to Solace ISSR Shilohs. Click here if you would like to see some of the adult temperament tests we've done on the Shilohs that have come from our breeding program. Click here if you would like to see pups that we've raised over the years. I plan to chronicle our years of adventures with Shiloh Shepherds and share our stories. We are taking the time to enjoy our Shilohs as they impact the quality of our life in a very positive way. Keep checking back with us as we will continue our website and share with you what we are doing. We look foward to also sharing our upcoming "Memoirs of a Dog Breeder" through our website, so please check back for updates. Our Shilohs have always been registered exclusively with the ISSR (International Shiloh Shepherd Registry - the registry of the Breed Founder). We live in a rural residential neighborhood about 30 minutes north of Seattle. Our dogs are family raised and loved and an integral part of our family. Enjoy our website and learn what we are about and feel free to ask questions. Have you ever met a Shiloh Shepherd in person before? They are a lot like the German Shepherds of days gone by - like Rin Tin Tin. 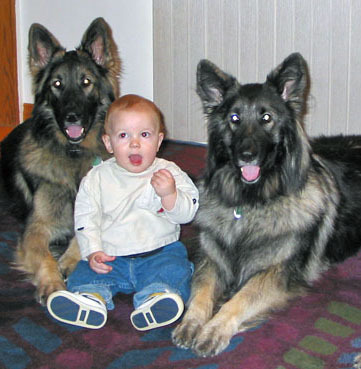 They have the intelligence of GSDs, but are softer in temperament and are larger in size, in both height and bone. They are gentle giants that can intimidate an intruder that is unwelcome, while being incredibly careful and caring around a newborn. I currently have four of these dogs that I raise around my fourteen year old son and they treat him with the same respect they give me. Shilohs tend to respect that which is important to you and therefore they are very easy to train. They have an intrinsic desire for you to be pleased with them and there is an intuitive quality about them. Be a strong leader and set your expectations very high for your Shiloh and your Shiloh will meet or exceed your expectations. These dogs love to think and be connected with you and your family and model themselves after their owners. Click on Testimonials to read what people have to say. 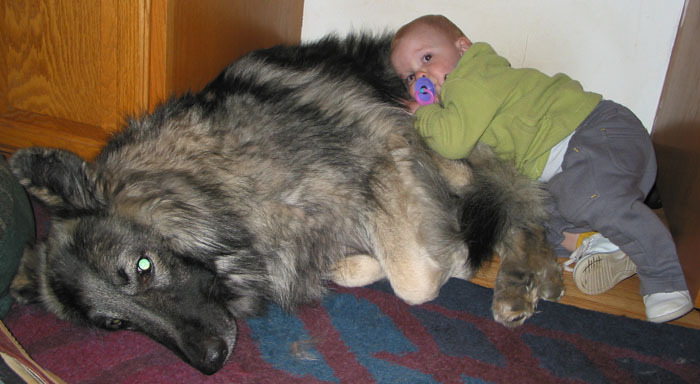 At Solace Shilohs, we have always taken raising Shiloh Shepherds very seriously. Solace Shilohs aim is to provide a healthy, stimulating environment for our Shilohs. We do not actively breed, but occassionally have a puppy for sale. We remain active in the Shiloh community.